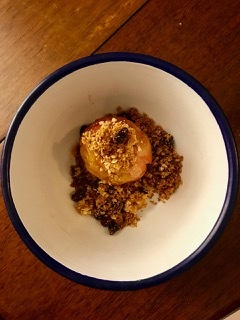 After a fun day out with the family picking apples at Broomfield Farm in Kent (a short train ride away from London), what better way to spend the evening than making these delicious crumble filled apples? These are a wonderfully warm and healthy dessert for a chilly Autumn evening and being able to give the kids a lesson in farm-to-table cooking is an added benefit. This easy to make pud is a bit like a reverse apple crumble except that it is free from refined sugar and provides the health benefits of a whole apple with each serving. The creaminess of the baked apple makes this dessert seem indulgent but it’s actually a much healthier alternative to the buttery crumbles or toffee apples that are prevalent at this time of year. They are especially fun to make with the kids whose little fingers are particularly adept at squishing the oat and almond mixture into the centre of the apples. Pre heat the oven to 150ºC / 140ºC Fan. Mix together the oats, almonds and sultanas in a medium sized bowl. Gently heat the coconut oil, maple syrup and cinnamon until melted. Pour the coconut and maple syrup mixture over the dry ingredients and stir until all the oats and almonds are coated. Remove a small sliver of the base of each apple to enable them to stand up straight, then use an apple corer to remove the centre and place them all into a baking dish. Push the crumble mixture into the centre of the apples, leaving a generous spoonful on top, and around the sides of the pan, which will crisp up as the apples slowly bake. Cover the baking dish with foil and place in the centre of the oven for approximately 1 hour, at which point the apples should be cooked through and a fork should easily pierce the flesh, meanwhile the crumble will be crunchy and golden. Serve with a drizzle of agave syrup and some yoghurt or, for an added treat, a scoop of vanilla ice cream!